« How complete is complete? The Gorgosaurus preparation on this side is now completed. 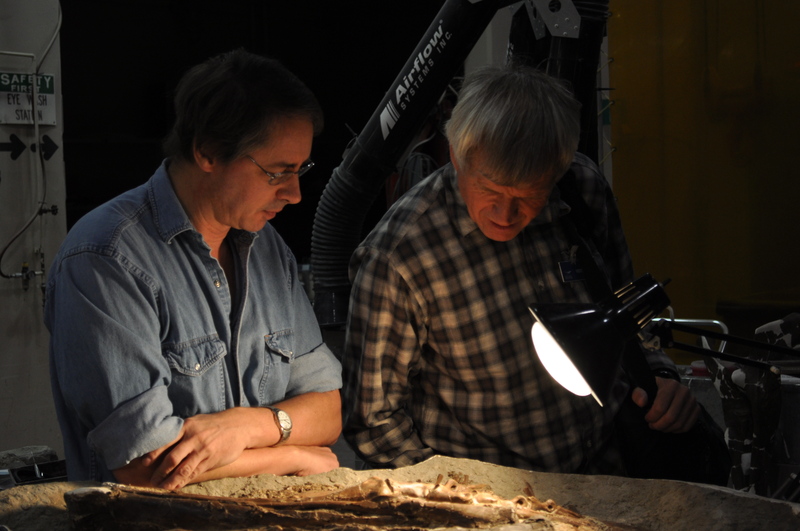 On February 18th, Dr. Philip J. Currie came to examine the specimen and do some research on it. He will likely return and do more once the specimen is flipped over. 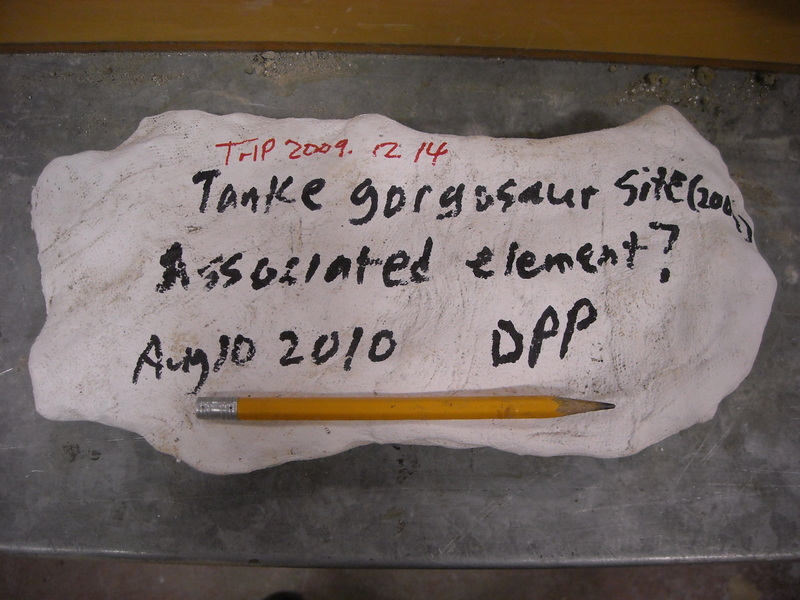 The specimen has now acquired a Dinosaur Provincial Park quarry number: the quarry site is now known as quarry 257. The only thing that needs to be done on the Gorgosaurus block now is the addition of a thicker, penetrating glue into all the rock surrounding the bones so it resists the deep penetration of the curing silicone molding compound and hold together when the mold is removed. This gluing will be done on February 22nd and will then be left for a week or so to fully dry while I am engaged in some other work. This means the rock will now be harder on the other side, but recall the glue is acetone-based so I can just use pure acetone to soften the glue as required. Even though the main block is done (on this side), there are still some small blocks that were removed during the initial fieldwork in 2009. These consisted of two blocks, one an epipterygoid (a palate bone) and a long mid-dorsal rib, with another unidentified bone alongside. The epipterygoid (opened jacked shown above)was started today and went quickly. It will be fully prepared out of the rock. A crew was working near the quarry in 2010 and when they revisited the site, they found another bone being exposed by erosion. Normally we dig 1 metre past the last bone and stop there. This bone was a little beyond that and it was missed, so was collected in 2010. I worked on that bone as well and see now it is an angular- one of the lower jaw bones positioned at mid-length along the bottom edge. It is good to have these skull bones but they tell us the skull will not be as complete on the other (upper) side as the side (bottom) we have been watching on this blog. Next updates will cover the molding process. I don’t know when this will start as some other Tyrrell staff do that work and they are (or soon will be) experimenting with the silicone rubber that will soon mold the Gorgosaurus. Dave writes: This is however, the end of the *preparation* series (hence the title) so we are rather drawing a line under this piece given that every practical part of the preparation has now been done and with Phil’s arrival the research phase of this specimen is beginning. While we will add more during he casting process, this is the end for now. We hope you have enjoyed this and any feedback on the series as a whole is most welcome. Thanks! 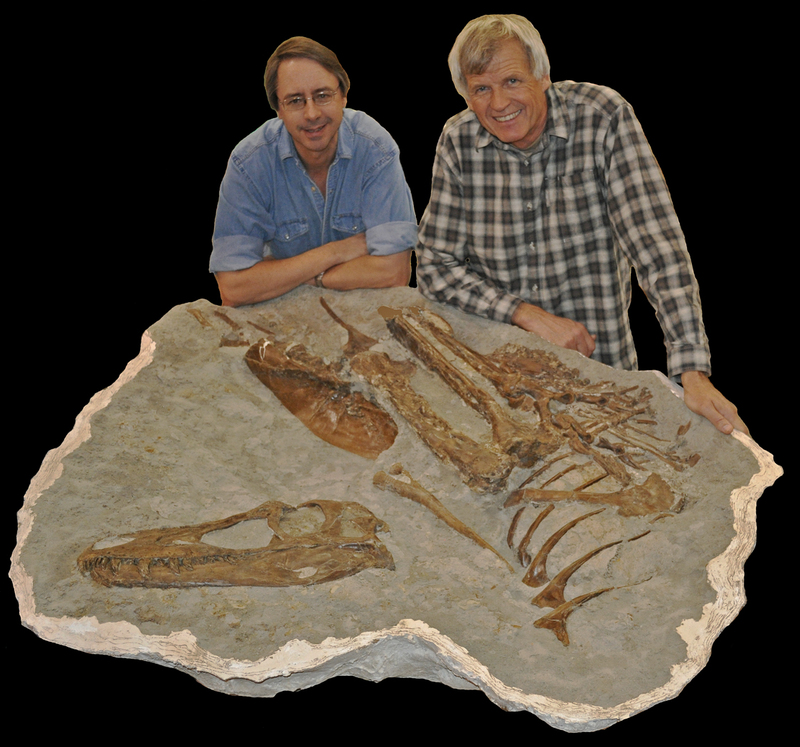 All photos here and in the series are owned by Darren Tanke and the Royal Tyrrell Museum. Beautiful work. Epipterygoids: the understudied skull bone. Less gets said of this bone than it deserves, largely due to how they are often very fragile, missed, lost, or are ignored in various other studies due to their fragility or brevity in crocs and bird skulls. Some of these lack these as bony elements, and that doesn’t help. Very nice. I presume the main focus is the great youth of the little tyant? A really enjoyable series and a wealth of information – especially for those of us use to prepping individual elements as opposed to something as superb as this partial tyrannosaurid. The skull is quite spectacular and, seeing Jaimie comment above has reminded me, I found the large size of a few of the maxillary teeth in this juvenile to be quite enlightening. Any similar serialised posts such as these would be very welcome in the future. Thanks Dave and Darren – it’s been great. An excellent series, thanks for sharing it. I should note that’s an ectopterygoid though, not an epipterygoid. 1. There were 3 smaller jackets to go with the Gorgosaurus main block, all disarticulated from the main specimen. 2. One jacket had a long dorsal rib with a small bone alongside I thought (in the field) might be an epipterygoid; collected 2009. Still unprepared. In one of the earlier postings I figured a ?epipterygoid, but Currie was not certain during his recent visit- it needs more preparation. 3. 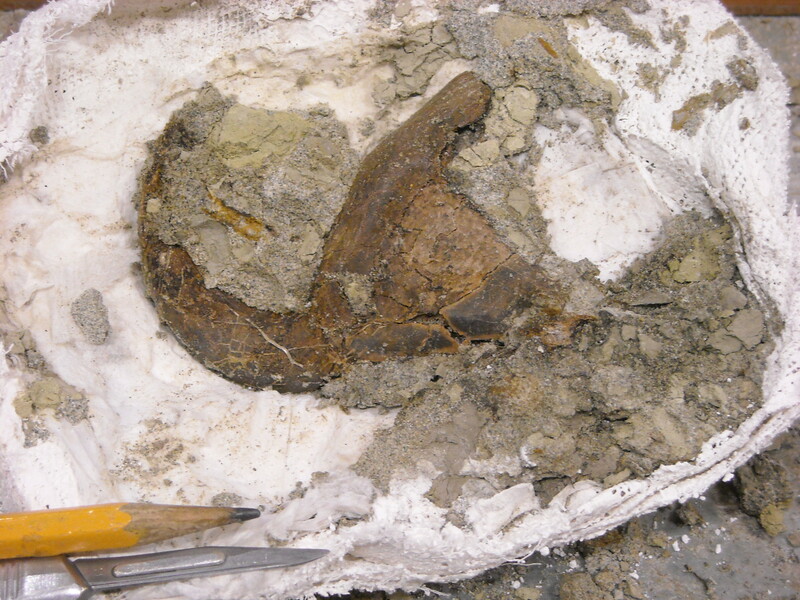 Another smaller, rounded jacket contained an ectopterygoid- that is shown in the posting undergoing preparation; collected 2009. 4. In 2010 another bone was found on the edge of the quarry. 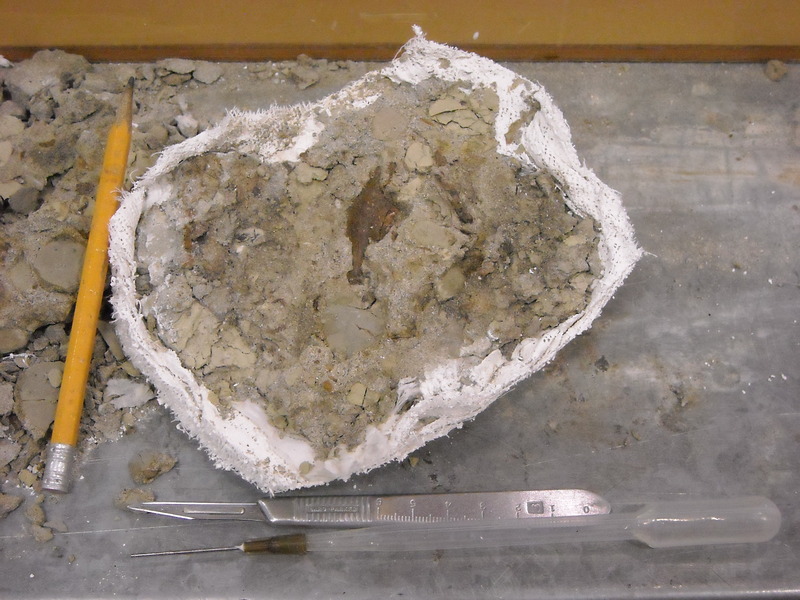 That bone was collected in 2010 in a small jacket- shown in the posting. That jacket was opened recently and yielded an angular. The are two little elements in separate blocks. The lower of them is certainly an ectopterygoid, given the hook-like process, but above it, what Dave was talking about, looks more like a triangular element with a flange extending upwards; it seems symmetrical. This element is what I felt I was referring to. This has been an absolutely fascinating series of posts. I found it to be both educational and highly enjoyable. Darren, thanks again for the time taken to explain every little step of the process and the amount of detail that you included, both regarding preparatory techniques and also the various custom-manufactured tools and apparatus that you employed. Thanks also to The Royal Tyrell Museum for being cool with Darren posting all these words and photos, and Dave for hosting. Thanks indeed for the entire series! As an artist and amateur, it’s great to see what what dinosaurs really look like when they come out of the ground, before they have been prettied up for the museum-going public. A wonderful series of posts–I’ve enjoyed them all, and I learned so much! Excellent photographs, as well. The end product is beautiful. I hope that skeleton serves you guys well for a long time! Nothing to add to what has been said above, except that the articles were quite understandable for a layperson like myself as well. Thanks, and I’m looking forward to further posts. That’s great to know, thanks for the feedback. it is difficult to pitch it such that interested people wioth little or no background can get it and get into it, but also keep the info flowing for exisitng experts and those with a background in this. I think Darren did a great job on this, but it’s nice to hear it comeing from other people too!